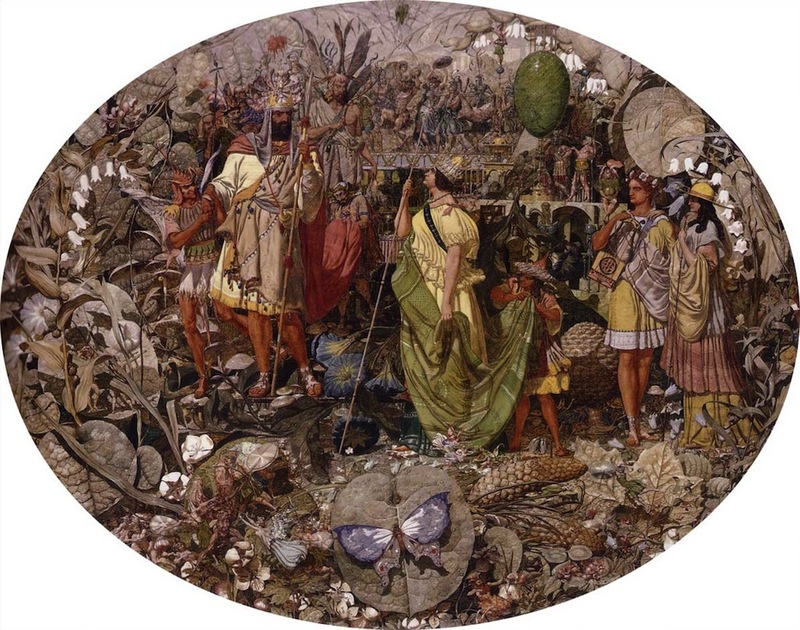 Contradiction: Oberon and Titania by Richard Dadd, 1817-1886. 1854-58. Oil on canvas, 61 x 75 cm (24" x 29.5"). Private Collection. Source: The Athenaeum, which kindly allows reuse of its artwork (derived from old catalogues etc.) "in any way, as long as you credit us." [Click on the picture to enlarge it.] Commentary by Jacqueline Banerjee. As in Mercy: David Spareth Saul's Life (1854), Dadd depicts a confrontation, this time not from the Old Testament, but from A Midsummer Night's Dream, Act II, scene I: the famous "Ill-met by moonlight" scene. Here, the couple are already at odds, but Oberon still presses his demand for Titania's "little changeling boy" to be his "henchman" (ll.120-21). Because the boy's dead mother was her votary, Titania is adamant in her refusal: "for her sake I do rear up her boy / And for her sake I will not part from him" (ll.136-37). In this painting, there is no forbidding gesture, just the two principals standing in a tense stand-off, focussing intently on each other. Oberon grips a long spear and is held or held back by Puck, whom he addresses after Titania's exit. Puck, typically, seems to be enjoying the whole spectacle. Another fairy-creature holds up Oberon's train, and a figure looms behind this attendant, with a loose robe and a bow, his eyes also bent on Titania (could it be her lover, Theseus? He has evidently been hunting: a bird dangles from his free hand). Titania, her wand as long as Oberon's spear, but tipped by a star, has a goblin-like attendant of her own to hold up her train. Behind her stands the youth himself, holding a lyre. He can identified by the crown of flowers, which Oberon has complained about, but his companion's identity is unclear. Perhaps she is watching over him for Titania. She too holds a wand, and her hand is on the youth's shoulder, as if she is protecting him. Titania's anger is reflected in the fact that, unknowingly it seems, she is crushing a tiny fairy underfoot. The little creature's head and arms, one outflung, can only be seen on close inspection. A butterfly or moth on a greyish brown lily-pad dominates the centre foreground, with a fairy to its left, flying towards a scene of war. The background to the confrontation is packed with details that challenge perception and even comprehension. Behind Titania and Oberon, on a decorated deck, is a satyr surrounded with revellers. Two stems of white bell-flowers emphasize each side of the oval, and blue morning glories (or similar), and other flowers, appear among and around the figures, together with meticulously painted toadstools, pinecones and fallen leaves. Structurally important is the large green decorative hanging egg that so brilliantly counters the oval shape of the composition as a whole. The horizontal lines of the architecture in the background, with columns and arches, similarly counters the two slanting uprights of Oberon's spear and Titania's wand. In the scene from A Midsummer Night's Dream, Oberon does say that the natural order of things has been thrown into confusion, producing a "mazed world" (l.113). Yet the attempt at ordering and the minute attention to every square inch of the canvas here demonstrates the artist's desperate impulse to see and impose patterns on it. It is sad to think that the painting reflects poor Dadd's struggle with his own "mazed" mind, during four years of his life in Bethlem: Patricia Allderidge tells us that it "was painted for the Bethlem physician superintendent Dr Charles Hood." On the other hand, Contradiction: Oberon and Titania is generally acknowledged to be a compelling and truly extraordinary work of art, in the fairy-painting category especially. Oberon and Titania were popular subjects for other fairy-painters too (see Greysmith 81), but no one else achieves this kind of intensity. Allderidge, Patricia. "Dadd, Richard (1817-1886)." The Oxford Dictionary of National Biography. Online ed. Web. 26 March 2015. The Athenaeum. Web. 25 March 2015.